Table 1. 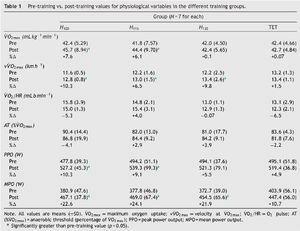 Pre-training vs. post-training values for physiological variables in the different training groups. Table 2. Pre-training vs. post-training values for 300-m performance, 3000-m performance, and Tmax in the different training groups. Table 3. 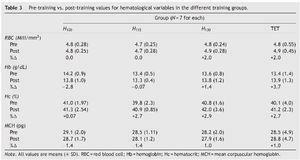 Pre-training vs. post-training values for hematological variables in the different training groups. Valorar y comparar los efectos de las adaptaciones fisiológicas y de resistencia del entrenamiento por intervalos de alta intensidad (EIAI) sobre el entrenamiento de resistencia tradicional (ERT), modificando la intensidad del ejercicio, en mujeres patinadoras de velocidad en línea entrenadas. Las participantes fueron asignadas aleatoriamente a uno de los 3 grupos EIAI: 6, 8, 10 (repeticiones/sesión de 1 a 3 semanas respectivamente) × 60 segundos (s) a una velocidad de carrera asociada al ( ) (H100, n = 7), (H115, n = 7), y (H130, n = 7), 1:3 relación esfuerzo recuperación; y/o grupo ERT (n = 7): 60 min de carrera 75% tres sesiones por semana. Se hallaron las siguientes mejoras significativas (p < 0,05) (excepto, como se indica) EIAI en: (H100 = +7,6%, H115 = +6,1%, H130 = +0,1%; p = 0,4), (H100 = +10,3%, H115 = +6,3%, H130 = +9,8%), pico de potencia máxima (PPO) (H100 = +10,3%, H115 = +9,1%, H130 = +5,5%; p = 0,2), potencia media (MPO) (H100 = +22,6%, H115 = +24,1%, H130 = +21,9%), rendimiento 3.000 metros (m) de patinaje (H100 = −15,2%, H115 = −7,9%, H130 = −10,6%), y Tmax (H100 = +39,4%, H115 = +5,0%; p = 0,5, H130 = +17,8%; p = 0,1). No se hallaron diferencias entre los grupos. Tampoco se hallaron cambios en estas variables en el grupo ERT. Estos hallazgos sugieren que tres semanas de un programa EIAI, a un entrenamiento bajo (unos 6 o 10 min por sesión), se asocia a mejoras en el rendimiento de 3.000 m de patinaje en , , PPO, MPO, y Tmax en mujeres patinadoras de velocidad en línea entrenadas. To evaluate and compare the effects of high-intensity interval training (HIIT) varying in exercise intensities to traditional endurance training (TET) on physiological and performance adaptations in trained female inline speed skaters. Participants were randomly assigned to one of 3 HIIT groups: 6,8,10 (repetitions/session from 1st to 3rd week respectively) × 60 seconds (s) at the running speed associated with ( ) (H100, N = 7), (H115, N = 7), and (H130, N = 7), 1:3 work to recovery ratio; and/or TET group (N = 7): 60-minute running at three sessions per week. Significant (except as shown) improvements (p < 0.05) following HIIT were found in: (H100 = +7.6%, H115 = +6.1%, H130 = +0.1%; p = 0.4), (H100 = +10.3%, H115 = +6.3%, H130 = +9.8%), peak power output (PPO) (H100 = +10.3%, H115 = +9.1%, H130 = +5.5%; p = 0.2), mean power output (MPO) (H100 = +22.6%, H115 = +24.1%, H130 = +21.9%), 3000 meter (m) skating performance (H100 = −15.2%, H115 = −7.9%, H130 = −10.6%), and Tmax (H100 = +39.4%, H115 = +5.0%; p = 0.5, H130 = +17.8%; p = 0.1). No significant differences were found among groups. Also, no changes in these variables were found in the TET group. Present findings suggest that three weeks of HIIT program with low volume (almost 6 or 10 min per session) is associated with improvements in , , PPO, MPO, 3000 m skating performance, and Tmax in trained female inline speed skaters. would induce greater physiological and performance adaptations compared to higher intensities. Twenty-eight female inline speed skaters (mean ± SD; age: 20 ± 4 years; height: 160.5 ± 13 cm; body mass: 59.5 ± 13 kg) volunteered for the study. All subjects had a minimum of 3 years of inline speed skating experience (years’ experience: 7 ± 3 years), competed at the national level, and currently trained at least 3 times per week. Prior to any participation, the experimental procedures and potential risks were explained fully to the subjects and all provided written informed consent. All the procedures were in accordance with ethical principles of declaration of Helsinki, approved by ethical committee of local University. (Tmax). The second day included a 30-second lower-body Wingate test to determine peak power output (PPO) and mean power output (MPO) on an electrically braked ergometer. The third day consisted of a sport specific 300 m and 3000 m time trial on a 200 m skating track. Figure 1. Overview of experimental protocol. PRE, pre-exercise; POST, post-exercise; HIIT, high-intensity interval Training; TET, traditional endurance training; wk, week; d, day; S/wk, sessions/week; B/S, bouts/session. Following pre-testing participants were randomly assigned to one of four groups. Participants completed either a progressive HIIT program or TET program three sessions per week. These protocols were modified from previous research using similar training intensities and durations.7, 15 Two days after the completion of the last training session participants repeated the same battery of tests in the same order and under similar conditions as pre-testing. Dietary food records were collected two days before pre testing and this diet was replicated prior to post testing, to reduce any dietary influence on performance. , O2 pulse and AT, participants performed an incremental treadmill test consisting of a 3 min walking warm-up at 6 km h−1 with 0% incline, followed by 1 km h−1 increments each minute until volitional exhaustion.7, 16, 17 Metabolic variables were measured using a gas analyser (Cosmed K4B2, Italia) that was calibrated before, and verified after each test according to the manufacturer's instructions. despite an increase in running speed; (2) a respiratory exchange ratio (RER) higher than 1.1; (3) a heart rate within 10 bpm of its predicted maximum; and/or (4) volitional exhaustion. Blood sampling. For hematological measurements, blood was drawn by venepuncture and dispensed into EDTA tubes. Red blood cell (BBC), hemoglobin (Hb), hematocrit (Hct), and mean corpuscular hemoglobin (MCH) counts were measured using an automated cell counter (Diatron, Abacus C, Hungary). .9 All subjects were instructed to not engage in strength training or change their diet for the duration of the study.21 All training sessions for all groups were directly supervised by a study investigator. Results were expressed as means ± SD. The Shapiro–Wilk's test was used to test the normality of the distribution. A 2 (pre, post) by 4 (groups) repeated-measures ANOVA compared changes in the dependent measures over time and between groups. A Tukey's post hoc test compared differences between groups when a significant F-ratio was observed. Statistical analyses were completed using Statistica, version 8.0 (StatsSoft Inc., Tulsa, OK), with α set at ≤ 0.05.
) to all training protocols. PPO was not significantly different among groups, but significantly improved in H100 (p = 0.03) and H115 (p = 0.05); despite no changes following H115, H130, and TET. MPO was significantly improved in H100 (p = 0.01), H115 (p = 0.01) and H130 (p = 0.01) and remained unchanged following TET (p > 0.05). No significant differences were observed among groups in PPO and MPO. The 3000-m time trial performance was significantly improved following H100 (p = 0.05), H115 (p = 0.04), and H130 (p = 0.004); while there was no significant change following TET (p > 0.05) (Table 2) with no difference among groups. There was no significant interaction, time or group effect for the 300 m time trial (Table 2). Tmax significantly increased following H100 (p = 0.01), while did not improve following H115, H130, and TET. There was no significant interaction, time, or group effects for any of the hematological responses (RBC, Hb, Hct, and MCH) (Table 3). provided superior cardio-respiratory responses following 3 weeks of training. improvement following HIIT are due to peripheral adaptations. Mechanistically, HIIT activates AMP-activated protein kinase (AMPK) and p38 mitogen-activated protein kinase (MAPK) which are both known to activate peroxisome proliferator-activated receptor co-activator (PGC-1α) and have been implicated in exercise-induced mitochondrial biogenesis.13 PGC-1α coactivates transcription factors to activate signaling pathways leading to mitochondrial and metabolic adaptations.13 A limitation of the present study was no muscle biopsies were taken to directly determine muscle oxidative capacity. Future research examining oxidative capacity in trained female athletes is warranted.
. These results suggest that the precise mechanisms that enhanced 3000 m skating performance after different types of HIIT used in our experiment were multifactorial. Data from other studies suggest HIIT can stimulate a range of adaptations that might improve performance aside from changes in AT. For example, enhanced muscle buffering capacity19 as well as increases in Na+/K+ pump capacity,9 and/or motor unit activation26 could be other potential adaptations that may contribute to an improvement in endurance performance following HIIT as recorded in our study. However, these markers were not directly assessed in the present study. by 32%. Smith et al.11 reported a significant increase (33%) in Tmax after 4 weeks of HIIT. A decrease in the rate of glycogen depletion and thus improved exercise tolerance,16 as well as greater muscle buffering capacity12, 28 are potential contributing factors for the improved Tmax. , 1:3 work to recovery ratio). In another study, Farzad et al.16 demonstrated that peak and mean anaerobic power increased after 4 weeks of running HIIT (6 × 35-meter all-out running with 10-second recovery between each sprint). Enhanced muscle phosphocreatine concentration,16 anaerobic enzyme activities20 and a significant increase in fast oxidative glycolytic fibers, along with a decrease in percentage of slow twitch fibres16 may contribute to the present findings. A limitation of the present study was the non-specific training. Stangier and colleagues,5 examined the influence an 8 week running or cycling program on inline speed skating performance. Both running and cycling were sufficient to improve sport specific performance over time despite possible decrements in skating technique. Furthermore, it is important to note that inline speed skaters often perform non-specific training during the winter months, since weather conditions make regular sport specific training difficult5 more accessible modalities (e.g., treadmills) are often used.
. Despite differences in cardio-respiratory improvements all HIIT groups were able to significantly improve 3000 m time trial performance. Future research is required to determine the ideal training intensity and volume as well as how to incorporate HIIT into a periodized annual training plan to optimally improve female inline speed skating performance. In addition, future research examining sport specific training is warranted. Considering that such training protocols have a very low volume, inline speed skaters and their coaches can use this type of training prescriptions when speed skaters have to reach several peaks over an annual cycle, particularly when the aim is to increase performance in limited period. The authors thank Professor Philip Bishop for his precious scientific assistance and our participants for their time and effort. E-mail address: m.sheykhlouvand@gmail.com (M. Sheykhlouvand). A power equation for the sprint in speed skating. J Biomech. 1992;25:573-80. Compromised oxygen uptake in speed skaters during treadmill in-line skating. Med Sci Sports Exerc. 1996;28:120-7. The influence of air friction in speed skating. J Biomech. 1982;15:449-58. Hemoglobin level in elite speed skaters from 2000 up to 2005, and its relationship with competitive results. Int J Sports Med. 2007;28:16-20. Effects of cycling vs. running training on endurance performance in preparation for inline speed skating. J Strength Cond Res. 2016;30:1597-606. Characteristics of inline speed skating incremental tests and effect of drafting. Int J Sports Med. 2006;27:818-23. Hormonal and physiological adaptations to high-intensity interval training in professional male Canoe polo athletes. J Strength and Cond Res. 2016;30:859-66. The effects of high-intensity interval training in well-trained rowers. Int J Sports Physiol Perform. 2009;4:110-21. Manipulating high-intensity interval training: effects on V˙O2max, the lactate threshold and 3000 m running performance in moderately trained males. J Sci Med Sport. 2007;10:27-35. The scientific basis for high-intensity interval training. J Sport Med. 2002;32:53-73. Effects of 4-wk training using Vmax/Tmax on V˙O2max and performance in athletes. Med Sci Sports Exerc. 1999;31:892-6. Short-term sprint interval versus traditional endurance training: similar initial adaptations in human skeletal muscle and exercise performance. J Physiol. 2006;575 Pt 3:901-11. A practical model of low-volume high-intensity interval training induces mitochondrial biogenesis in human skeletal muscle: potential mechanisms. J Physiol. 2010;588:1011-22. Training for intense exercise performance: high-intensity or high-volume training? Scand J Med Sci Sports. 2010;2:1-10. Effects of high-intensity interval exercise versus continuous moderate-intensity exercise on postprandial glycemic control assessed by continuous glucose monitoring in obese adults. Appl Physiol Nutr Metab. 2014;39:835-41. Physiological and performance changes from the addition of a sprint interval program to wrestling training. J Strength Cond Res. 2011;25:2392-9. Anthropometric, physiological, and performance characteristics of elite Canoe polo players. Psychol Neurosci. 2015;8:257-66. Significance of the velocity at V˙O2max and time to exhaustion at this velocity. Sports Med. 1996;22:90-108. A new method for detecting anaerobic threshold by gas exchange. J Appl Physiol. 1986;60:2020-7. Muscle performance and enzymatic adaptations to sprint interval training. J Appl Physiol. 1998;84: 2138-42. Influence of high intensity interval training on adaptations in well-trained cyclists. J Strength Cond Res. 2005;19: 527-33. Run sprint interval training improves aerobic performance but not maximal cardiac output. Med Sci Sports Exerc. 2011;43:115-22. Metabolic adaptations to short-term high intensity interval training: a little pain for a lot of gain? Exerc Sport Sci Rev. 2008;36:58-63. The effect of high-intensity interval training on ventilatory threshold and aerobic power in well-trained Canoe polo athletes. Science Sports. 2016;31:283-9. The effect of endurance training on parameters of aerobic fitness. Sports Med. 2000;29:373-86. Neural, metabolic, and performance adaptations to four weeks of high intensity sprint - interval training in trained cyclists. Int J Sports Med. 2004;25:92-8. Use of blood lactate measurements for prediction of exercise performance and for control of training, Recommendations for long-distance running. Sports Med. 1996;22: 157-75. Time to exhaustion at V˙O2max is related to the lactate exchange and removal abilities. Int J Sports Med. 2002;23:433-8.